MANY PEOPLE BESIDESthe fishermen and Philip and Nathaniel and Matthew, the publican, followed Jesus. His teachings were so wonderful that others wished to be learners, or disciples, of him, and so they followed in his company from one place to another. 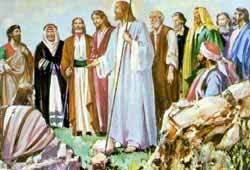 But the time came when Jesus wished to choose from among their number twelve men whom he could prepare to help in his great work. These men he wished to send out to places where he had never yet been, and have them preach to the people in those places about the kingdom of God. This entry was posted in Discipleship and tagged Alphaeus, Apostle, Capernaum, Christ, Christ Jesus, God, Gospel of Luke, Gospel of Matthew, James, Jesu, John, Judas Iscariot, Luke, New Testament, Simon, theology. Bookmark the permalink.